My sister Kim telephoned out of the blue to say she wouldn't be using the chalet apartment she'd rented in the Swiss Alps the first two weeks of March. Not one to pass up a travel opportunity, I started scrolling Orbitz as my sister gave me details. The two-bedroom apartment was located in Saanen and the balcony overlooked a rushing river. By the time we got off the phone, I knew that Geneva was the nearest airport and a connecting train left from within the terminal. I'd spend a week on my own, then my partner Tony (though he didn't yet know it) would join me. 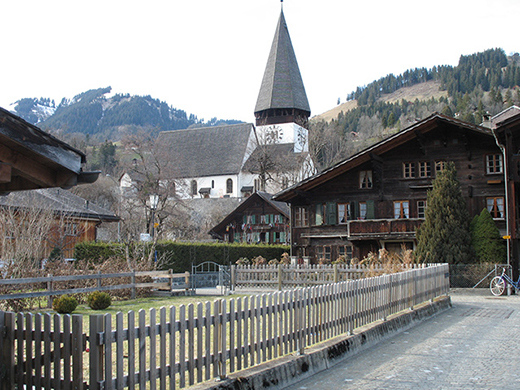 I had never heard of Saanen, but would come to discover there isn't a more perfect base for exploring the strikingly beautiful area called Saanenland in the southwestern corner of Switzerland that includes Rougemont, Schönried, Saaenmöser, Château-d'oex, Lauenen, Turbach, and jetsetty Gstaad among others. All structures in this part of the Alps are traditional wooden Bernese farmhouses or chalets, with carved gables and overhanging roofs; in spring every balcony is adorned with flowerpots. 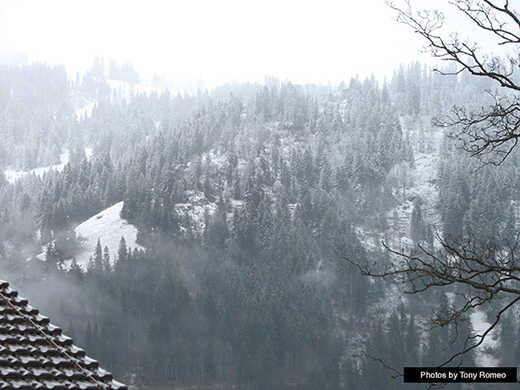 The first morning in Saanen I awoke to a snowstorm, and as I made my way to the Early Beck patisserie through snow up to my knees (I have my priorities), I fell in love. And it wasn't only because of the firm Nusstorte (nut cake) dense with caramelized walnuts that I'd tucked deep into the pocket of my ski jacket. 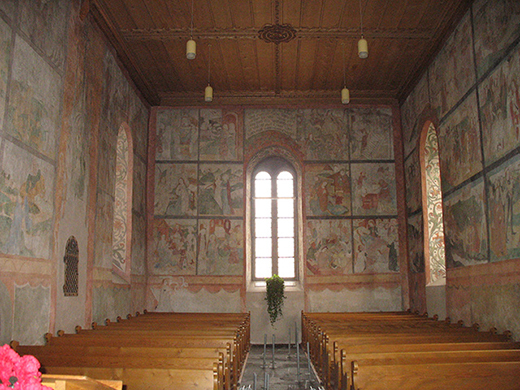 The interior of the town church was covered with frescoes from the second half of the 15th century. The cozy burger restaurant JAM with roaring fireplace gave each diner a long list of condiments and side dishes written in German, French and English and you simply checked off what you wanted. The train station that took us everywhere we wanted to go was a short walk from our chalet. I bought an unlimited pass for half-price tickets and had everything scoped out by the time Tony arrived. Small postal buses connect the many car-free villages in the Alps, but we could walk to Gstaad in 25 minutes following the river that drifted through back country past a small farm with plump cows wearing huge vintage metal bells. Our route brought us out on main street a block from Pernet Comestibles World of Fine Food (an 80-year-old institution) and the Coop supermarket where we did our shopping. The majestic Palace Hotel (another institution) looms over the town from every angle; champagne truffle fondue at the Palace is a "must" splurge. 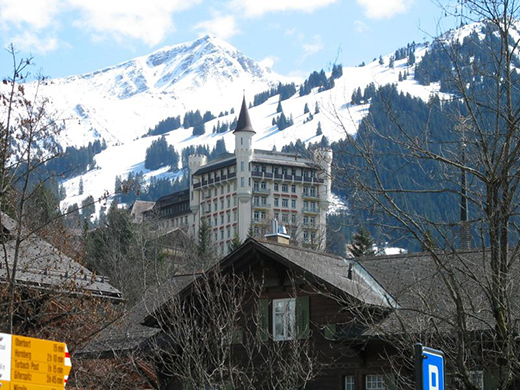 It's almost impossible to read about Gstaad without encountering adjectives like snobby and elitist. We didn't find it so for a second. One of the most memorable things to do in Saanenland is to have lunch at one of the mountaintop restaurants that can be reached only by chairlift. 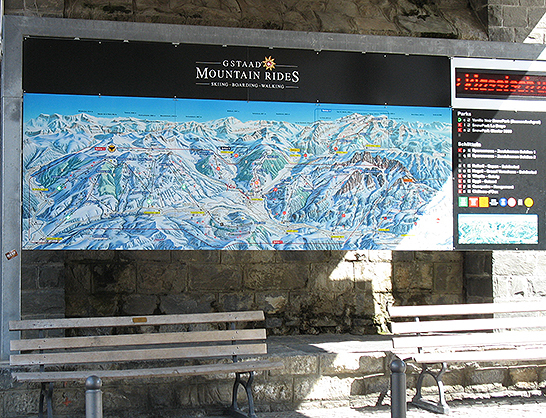 We chose to take the bus from Gstaad to the lift at the base of Wasserngrat Mountain. The day was sky blue perfect and people wearing fashionable jackets mingled on a terrace with a panorama of snow-covered Alps in the background. We copied the locals and selected a few of the freshly piped meringues piled in handmade wooden containers served with 48% fat double cream. It amused me that contrary to America, the higher the fat content, the bigger the selling point. Fur blankets were strewn about to wrap yourself in if you felt a chill. 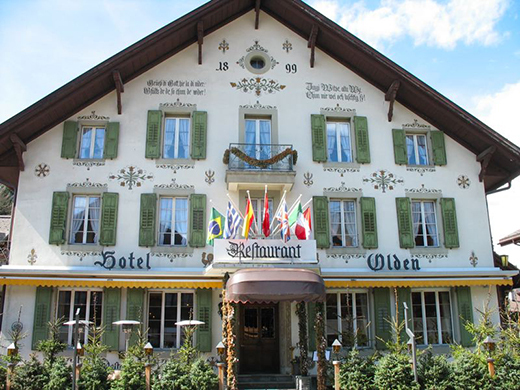 The restaurant inside is renowned for Bündnerfleisch (thin strips of air-dried lean beef), but there were so many typical dishes on the menu it was difficult to choose. After taking the lift back down, we took the Turbach postal bus to the last stop at Rotengraben before it returns to Gstaad, making note of a sign for Alpkäse (homemade Alp cheese) posted on the side of a barn. It's difficult to believe places like Rotengraben are real. Seemingly at the end of the world, the village has a minuscule post office and one tiny restaurant partially hanging over the side of a cliff. Rougemont was a favorite. An hour's walk from Saanen, 7 minutes by train, we always walked one way to justify ordering the fondue at Café du Cerf. Placards with drawings of hikers and skiers are posted at parallel trails so you know which is for which. There's a particularly authentic, unassuming atmosphere in this town. The church is over 900 years old; the Delikatessen sells artisinal Rougemont mountain cheeses you can't buy anywhere else. There are many off-the-slope activities: cross-country, snowshoeing, walking on glaciers and sledding (night sledding in the full moon when the weather is right is beyond comparison!). 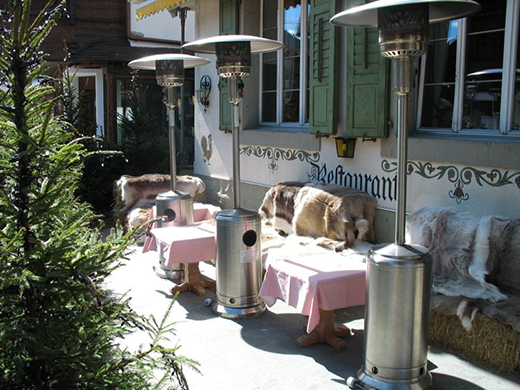 In Lauenen, horse-drawn sleighs wait in front of the Geltenhorn restaurant to bring you up to the lake. Spas and aerobic/yoga classes abound; most chalets have satellite TV with a good selection of stations in English. The efficient train system allows for easy day trips and we chose Bern because of the Paul Klee Museum; another time Gruyère, because I'd read that the castle is one of the most magnificent in all of Switzerland (it is!) and both Tony and I love cheese (if you hadn't already guessed). I don't think I'd visit the medieval hill town of Gruyère in high season, but it was gloriously free of tourists in March -- and the hills required more strenuous walking which turned out to be a good thing. 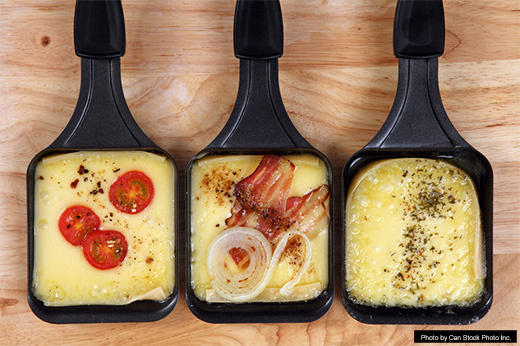 You can't come to Gruyère and not have Raclette for lunch. When they first put the two-pound round of cheese on the tabletop grill, Tony and I thought perhaps there was a misunderstanding and they were expecting another couple to join us. But as we scraped the last of the oozing roasted cheese onto potatoes and gherkins, Tony made me promise "never to speak of this again." The first two weeks of March are considered shoulder season in the Alps: the crowds have gone, yet most everything is still open. If you cost average, it's possible to spend a couple of weeks affordably in what's considered to be one of the most expensive parts of the world. Some dining experiences are unique and shouldn't be missed; but after hiking around all day, picking up great food and wine to enjoy at home can be just as enjoyable. And never underestimate the fun of snuggling under a comfy throw reading or watching a film on a cold winter's night. We were so smitten with Saanenland I checked online to get an idea of accommodation costs, and there were several fairly priced chalets on every site I searched. When our stationmaster (just having a stationmaster speaks volumes) first told us we didn't have to tote luggage back to New York, we were confused. He went on to explain that for $20 a bag (wrapped in plastic! ), he could forward them on to Geneva (or Zürich) where they'd be put on our flight. In other parts of the world we might have been skeptical, but we'd learned a lot about Switzerland in two weeks. Still, when we saw our bags rolling towards us on a conveyor belt at JFK the next day, we were in awe! *Disclaimer: I receive no compensation for my recommendations.